A crown is a tooth-shaped cap that is placed over a tooth. Crowns are often used when teeth are heavily decayed and too weak to survive with just a filling. A bridge is used when one or more teeth are missing. 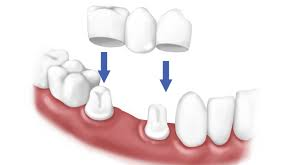 The bridge is fitted perfectly and cemented to your teeth and keeps your other teeth from moving out of place. Oceanfront Dentistry offers CEREC™ – the revolutionary system that produces durable high-quality ceramic dental crowns, onlays or veneers. For you this means we can repair and restore your damaged tooth with fewer injections, less drilling and in a shorter amount of time. With CEREC™ we can preserve more of your natural tooth enamel – and the CEREC™ ceramic restoration is tooth-colored and will restore your teeth to their original strength and function. And in most cases, CEREC™ allows us to restore you tooth in just one appointment without impressions, long waiting periods or temporaries. To learn more about CEREC™, click here.